We Are Right in the Middle of it — School Sports! Yes, it’s that time of year when school sports are running full force. I had a conversation with a dad yesterday who told me that a friend of his had 4 boys who all played soccer. This mom would pack food and beverages for the full day because she would get to the soccer field in the early morning and leave early evening. Each boy had a game to play that day. Now that’s an active family and a dedicated mom! But one can imagine the laundry that was created for that family after that full day of sports. So with all those sports our children are playing come piles of laundry. What can you do to keep your laundry room more manageable and even presentable? My laundry room is the first room I walk into from my garage. If it’s a mess and full of clutter and piles, it makes me not have a welcoming feeling in my own home. If that’s your feeling right now, change that by following a few easy tips for reducing laundry room chaos. Make the room fun and inviting by painting the walls a color you enjoy. Hang pictures on the walls to let it feel more like home. I have my daughter’s art work that was worth framing on these walls in my laundry room. Install shelves or cabinets to hold laundry supplies. Use plastic or stainless steel wire baskets to keep small items (such as stain stick, stain spray, scrub brushes, measuring cups, etc.) in to prevent them from toppling over. Have a basket for those dirty “sports” clothes to go in; especially if they are not being washed after each game. Don’t allow the clothes to just be dumped on top of the washer or dryer. Compile a list of stain removal tips (i.e. how to remove salad oil from clothing), laminate, and hang in the laundry room for quick fixes. If you don’t have cabinets to store your laundry supplies, attach a three-tier hanging metal basket from the ceiling to place them in. If you have a wash tub, get a piece of lightweight plastic board from your local hardware store to fit over the top and have it double as extra workspace for folding or sorting. Have a laundry hamper or a mesh laundry bag in every room where the family undresses. Hold them responsible to bring their laundry to the laundry room on laundry day. (Remind them not to put wet clothing or towels in a hamper. It will produce mold). Instruct/teach family members to turn clothes right side out. If they don’t follow, don’t wash! Set a laundry schedule and do it in one day. This works well for my family. Or if your family has large amounts of laundry, than wash one load each day. Post this schedule near each hamper or laundry bag. Start a lost and found for laundry items. You know those socks that get lost in outer space. You can even have an extra basket for socks. You will always know where to look for the match. If possible, make room for line drying. Inserting a rod over the sink area is a great idea for collecting any water drips. Hang or fold garments immediately after drying. This lessons the need to iron. Be sure to clean the lint trap after each drying. If possible, create an ironing station. Have one small basket for each family member. 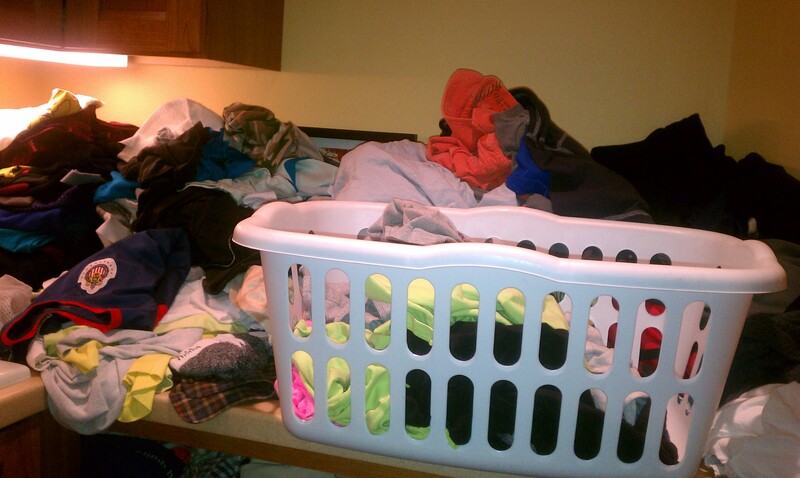 When laundry comes out of the dryer it can be folded and immediately put in the baskets for less sorting later. Hope you find these tips helpful and they create a much easier spring sports season!